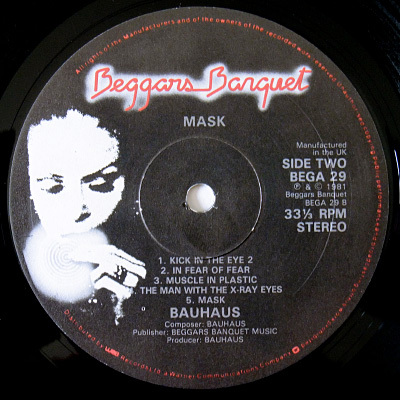 What we have here is the original release of the second Bauhaus album, ‘Mask’, released in 1981. I say original because it was later re-released in a slightly altered sleeve and label design (presumably after the breakthrough success of the ‘Ziggy Stardust’/’Third Uncle’ single, though I don’t know that for sure). The front and back of the cover remained the same, but as you’ll spy from the accompanying photos the inner gatefold of this version features a single band photo and all text in blue. The subsequent re-issue features a spread of photos taken from the shoot for the ‘Mask’ promo video and all text is in white. Label-wise, the original came with the standard-issue Beggars Banquet labels of a 1981 vintage – the later copies had the white/black Bauhaus ‘face’ design labels. There have been a couple of CD re-issues in gatefold mini-LP sleeve reproductions for this album now. 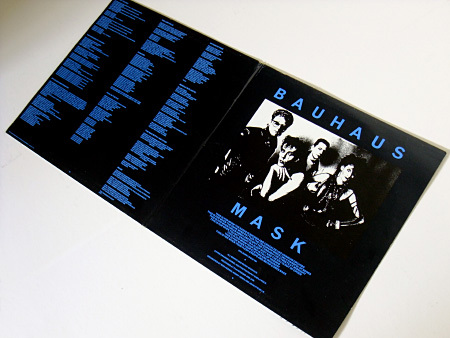 First to appear was the Japanese issue in 2004 (featuring the standard album tracks plus a selection of extra tracks from singles of the era) and then late in 2009 a boxed ‘Omnibus Edition’ was released – this featured the ‘Mask’ album on one CD with its original tracks only and in a reproduction gatefold sleeve, plus two additional CDs – one with singles/B sides/previously unreleased out-takes and the other with a 1981 live recording. 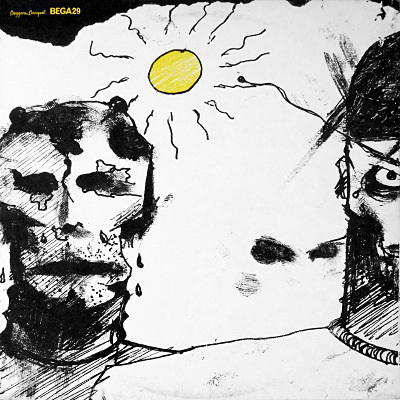 Both the Japanese mini-LP edition and ‘Omnibus’ re-issues have used the later sleeve design for their covers as opposed to the original version featured here today. ‘Mask’ is a fantastic album and the recent ‘Omnibus Edition’ has made me realise that even more. The additional out-take tracks and the accompanying book about the making of the album it comes packaged with make for an interesting peek at its creation. 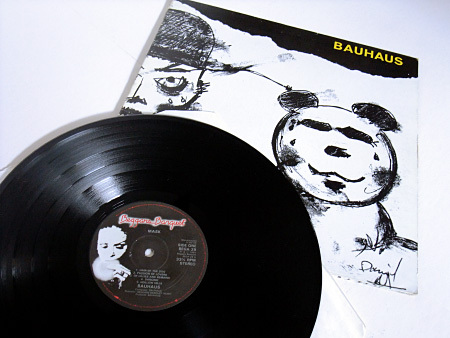 In the end, the versions chosen for the eventual album release work best, though ‘Muscle in Plastic’ in particular had a very different shape in its earlier drafts. ‘Hollow Hills’ resembles its final version but comes complete with the electric pulse of a rhythm machine in the rejected mix. Some of the other tracks included could have happily remained in the tape library, to be fair – the early take on ‘Ziggy Stardust’ is really a rather rough stab at it while ‘Dave and Danny’s Waspie Dub 2’ just meanders aimlessly. The time-scale of recording is quite impressive though, with the album having been recorded in various sessions through 1981. Having decided to reject the mix of the album that had been assembled in early July (the version that was bootlegged as the rejected mix), the band reconvened early in September for more recording and remixing, with the finished album mix completed by mid-September – some major surgery took place to the track list and all for the better, I feel, though tracks such as ‘Earwax’, ‘Poison Pen’ and ‘In Fear of Dub’ would later appear on the ‘Searching for Satori’ EP (one way or another in the case of ‘Poison Pen’… due to a mispress). More details on the Omnibus Edition on the Beggars Archive site. This entry was posted on Wednesday, June 23rd, 2010 at 10:10 pm	and is filed under Design crazy, Versions, versions. You can follow any responses to this entry through the RSS 2.0 feed. You can skip to the end and leave a response. Pinging is currently not allowed. There is also a difference to the outside covers – the yellow extends beyond the boundary of the circle on the reissue.